Featuring one-of-a-kind limited edition glass art for your home decor. 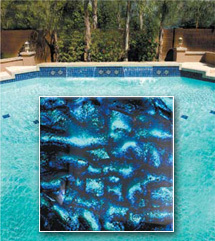 to your swimming pool with custom accent tiles. Add that special artistic touch to kitchens, bathrooms, cabinets and furniture with distinctly designed, fused-glass door pulls and knobs. 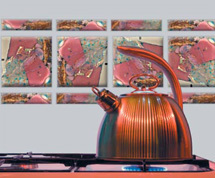 Dichroic glass tiles and liner bars add richness and beauty to walls, countertops, floors, and backsplashes. A unique and affordable way to change the look in any room with a new eye-catching focal point.